We are expert electricians in Los Angeles, servicing customers from LA to Long Beach to Orange County and everything in between. Our licensed electrician services will illuminate your life with the top-quality expert electrical contractor services from Alexander Electric. We can help with electrical maintenance for residential, commercial and industrial locations in Southern California. Call our electrical contractors for reliable electrical installation and maintenance services. Alexander Electric is a licensed electrical contractor that specialize in all aspects of electrical work. When you need a reliable residential electrician, commercial electrician, or industrial project of any size, trust us to get the job done right the first time. Contact us to speak with an electrical contractor today and learn more. Our state-certified electrical contractors offer top-quality electrical services that are held to the very highest standards. If our electrician can’t do it, then it most likely can’t be done. We have one standard and that’s quality. We are a veteran owned company that offers a variety of special discounts to veterans and members of the United States government. 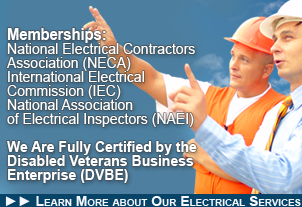 Call or e-mail an AEC electrician today for details. We offer complete electrical maintenance, inspections, and repair services that all come with a complete warranty. Our team is happy to work on any size project, no matter the job, small or large. No matter if you need a residential electrician or commercial electrician feel safe knowing that we have over a decade experience providing affordable and reliable solutions for our clients. You can always find an AEC electrician nearby. Our service areas cover Los Angeles, Long Beach and Orange County. Our electrical contractors are always nearby. The next time you run across an electrical issue you need fixed or an emergency problem that needs resolving call us so we can help. Our AEC electricians are licensed electrical contractors with over a decade of experience serving Southern California. We offer expert services for residential, commercial and industrial businesses. From installing ceiling fans in homes to commercial control panel rewiring and installations our electricians are here to help. to schedule an appointment with our team of electrical contractors. We are here to help and offer affordable solutions for your residential, commercial or industrial business.